Until Darwin: Science and the Origins of Race: Comment II on “Gould versus Morton”: Morton’s Crania Collection in the Context of the Final Decades of Natural History, Part One. At the very beginning of his great Animal Kingdom, Cuvier puts Natural History into its intellectual context, a context that framed Samuel George Morton’s work. It was the moment of the what seemed to be the ascendance of Natural History, which seemed to be on the verge of decoding the design of nature and so the will of its supposed Designer. In other areas, philology and geosophy were demonstrating a connection between languages, populations, histories and territories. This was also a period of great foment for Natural Historians, a moment when geology and the recognition of fossils provoked rational and religious disputes and radical interpretations of the history of the earth and its inhabitants. The study of human variety stood as a central concern of the time, because it was believed that the variation of humans held the key to the variation across nature. At this time, the most popular means of understanding human behavior, and one endorsed by many scientists, were the various theories of phrenological studies. Psychology as we know it did not exist and the explanations for deviate behavior or madness were thought to be found in changes to the body of the person. This is not a strange idea. Aristotle argued in his Politics and in De Anima that the appearance of the body corresponded to the goodness of the soul and so one could see in the bodies of slaves their slavish nature, while the body of free man would be of necessity, beautiful. This distinction between freeman and slave was a essential aspect of government. The later pseudo-Aristotelian Secreta secretorum is another example, though in its case, the medieval author took care to note that the types of man described were never found in a pure form, and that the real purpose of the King’s knowledge of human varieties was to be able to determine who was speaking the truth. The story of these views is fascinating and too involved for even a long digression, but well worth exploring at a later time. a1. Dynamics --- a special branch of General Physics which “considers bodies in mass, and proceeding from a very small number of experiments, determines mathematically the laws of equilibrium, and those of motion and its communication.” Dynamics is further divided into the fields of Statics, Hydrostatics, Hydrodynamics, Mechanics, Optics, etc. Were the practitioners of Natural History really different from the scientists of today in their approach to the rational study of the world? Well, of course the answer is yes and no. Yes, because they both recognized that observation, and hence the observer, were potential sources of error that make the discovery of general laws quite difficult. No, in that there were no scientists, and certainly no biologists as we know them today during Morton’s time. Nothing resembling the infrastructure and division of labor that characterizes contemporary science existed then. Naturalists communicated through societies, letters, and occasional monographs, though as the pursuit of naturalist studies became the domain of the wealthy amateur, the number of societies and publications steadily expanded. By the middle of the 19th century, Boston, Philadelphia, and Charleston stood as the centers for the study of nature in America, and were swiftly rising to international prominence as polygenism gained respectability in circles of naturalists and their societies, associations, and private research. In the midst of this rise of what came to be known as the American School, no one denied the relationship and antagonism between the study of nature, the church, and the institutions of slavery. It is correctly noted by both Lewis, DeGusta, et al. and by Gould that Morton’s distinguished himself from his contemporaries by his pursuit of empirical studies on human diversity. It is probably difficult to appreciate the degree to which Morton’s polygenism broke with the “sciences” of his day, such as phrenology, but one should not overstate the possibility of a break. Morton sought to put phrenological knowledge and polygenism on an empirical footing while supporting the Biblical account of creation. Morton was not trying to overcome Natural History, nor did he inadvertently inaugurate a “paradigm shift” in Natural History. The break would soon come with the publication of Darwin’s monogenist theory of life and variation. Morton was well acquainted with the very popular phrenologist George Combe and Combe writes the afterword to Morton’s Crania Americana. Friendship, of course, does not establish the continuity between Morton and phrenological analysis, his measurements do. When known to him, Morton carefully notes individual biographical data that is keeping with phrenological and pathological analysis. He notes in the introduction to his Catalog of Crania that while variation was his principle interest, phrenological analysis was also important. 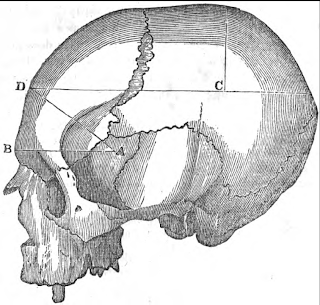 Two of the crania in the collection are phrenologically marked and the Crania Americana contains extensive tables of phrenological measurements on each skull. 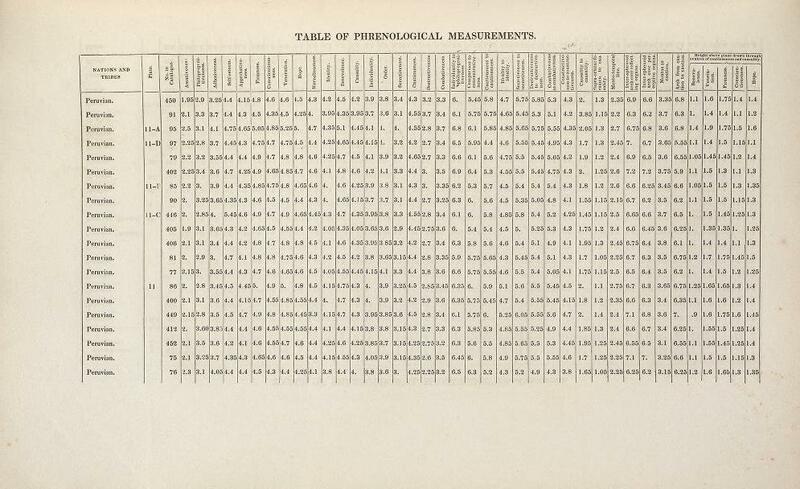 The accuracy of Morton’s measurements would of course be rather inconsequential to the question of the scientific legitimacy of phrenology, however, but would perhaps further rehabilitate him in some eyes and for their own reasons. Few if any return to Morton’s collection seeking to vindicate phrenology, of course, but Morton at the time of writing the Crania Americana was doing his work comfortably within the domain of phrenology. My Dear Sir:—Having now completed a task which has cost me some years of toil and anxiety, it gives me great pleasure to record the many obligations I owe you in the prosecution of these inquiries. To your ingenuity I am almost wholly indebted for the means of obtaining the elaborate measurements appended to this work ; which, without your personal aid and untiring perseverance, would have remained in a great measure unaccomplished. 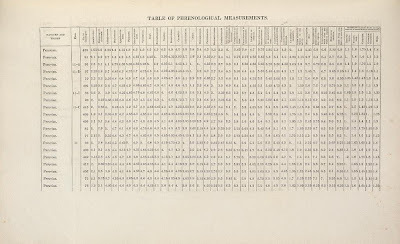 It may, perhaps, be thought by some readers, that these details are unnecessarily minute, especially in the Phrenological Table; and again, others would have preferred a work conducted throughout on Phrenological principles. In this study I am yet a learner; and it appeared to me the wiser plan to present the facts unbiassed by theory, and let the reader draw his own conclusions. You and I have long admitted the fundamental principles of Phrenology, viz: That the brain is the organ of the mind, and that its different parts perform different functions : but we have been slow to acknowledge the details of Cranioscopy as taught by Dr, Gall, and supported and extended by subsequent observers. We have not, however, neglected this branch of inquiry, but have endeavored to examine it in connection with numerous facts, which can only be fully appreciated when they come to be compared with similar measurements derived from the other races of men. Yet I am free to acknowledge that there is a singular harmony between the mental character of the Indian, and his cranial developments as explained by Phrenology. “We have adduced these proofs and authorities in support of the proposition that size [of the brain] influences power, because we conceive it to be a principle of fundamental importance in every investigation into the natural history of man, founded on the physiology of the brain; and also because in the hasty zeal of many of the opponents of phrenology, to undermine the discoveries of Dr. Gall, it has been denied with a boldness and pertinacity more allied to the spirit of contentious disputation, than to that of philosophical inquiry. Its importance in a dissertation on national crania is very apparent. One of the most singular features in the history of this continent is, that the aboriginal races, with few exceptions, have perished, or constantly receded, before the Anglo-Saxon race, and have in no instance either mingled with them as equals, or adapted their manners and civilization. These phenomena must have a cause; and can any inquiry be at once more interesting and philosophical than that which endeavors to ascertain whether the cause be connected with a difference in the brain between the native race and their conquering invaders? Farther, some few of the American families, the Auracanran, for instance, have successfully resisted the Europeans; and the question is important, whether in them the brain be in any respect superior to what it is in the tribes which have unsuccessfully resisted? Dr. Morton's last contribution (“Physical Type of the American Indians," in Schoolcraft's Information respecting the History, Condition and Prospects of the Indian Tribes of the United States. Part 2, p. 315. ) to craniographical science, which was published after his death, shows conclusively that his views respecting the homogeneity of the aboriginal American races had undergone no change whatever. In this paper he still maintains the doctrine of a uniform, cranial type for these races, with the same arguments and in language almost identical with that which he employed in his Inquiry ten years before. I make these references to his published opinions to show that Dr. Morton perseveringly inculcated this doctrine from the inception to the very close of his ethnological studies, comprising a period of about twenty-one years; that he was thoroughly convinced of its truthfulness, and regarded it as one of the best established and most readily demonstrable of all the conclusions at which he had arrived after a long and unwearied study of his cranial collection. Meigis, whose work I will post as another document in the near future, notes the contemporary critiques of Morton’s views, critiques that indicate that Morton’s views were already being critiqued on the basis of his data and his conclusions, especially on the uniqueness and uniformity of the Native American crania --- it was contemporaneous with Emerson’s American Scholar proclamation of American exceptionalism, by the way. Naturalists such as Josiah Nott ( http://pratt.academia.edu/BRicardoBrown/Papers/250266/Josiah_Nott_2007_ ) used the polygenic theory to support both the institutions of Southern slavery and to further the freeing of inquiry from the influence of religious dogma. Morton was generally quite reluctant to even admit that his views might contradict the authority of religion, but his acolytes Josiah Nott and George Gliddon were not so shy about their ideological commitments and it is Gliddon to whom Morton dedicated his Crania aegyptiaca. After all, Gliddon had supplied many of the skulls either directly or indirectly through intermediaries and grave robbers while he and later his nephew served as American diplomats in Egypt. So, Morton’s social milieu of the middle 19th Century was complex, and his reason's for collecting his data nd his interpretations of that data, like those of his rival Bachman take note of these complexities. Why else, indeed, would he have undertaken the collection and study of crania if it were not that the understanding of human variety had become a pressing problem of society and the rational administration of its populations? 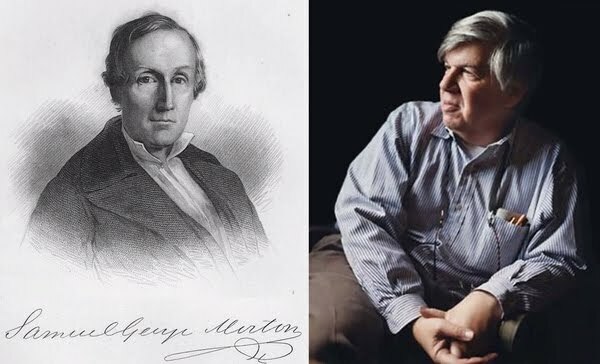 While there is a continuity between Morton’s work and phrenological studies, it the connection would become strained over time as Morton moved away from the needing the umbrella of authority that phrenology then offered. And again, as noted in the previous comment, there are also deep fractures and breaks between Morton’s work and later work in criminal anthropology, eugenics, and intelligence testing. Gould overstates the degree of continuity between these, but the attempt to revise Morton as an objectivist also glosses over the degree to which the questions Morton sought the answer were asked within his specific social and intellectual milieu. It is a bit dodgy to maintain that the new study proves that Morton had NO interested in differences in intelligence between races of humans that he thought represented separate primordial forms. He certainly believed that the capacity of the cranium was correlated with mental and moral endowments as well as an indicator of the creation of humans as separate primordial forms. On the other hand, he certainly did not understand intelligence as we might today, and intelligence testing in relation to biological determinism in the late 2oth century was Gould's concern. That Morton’s measurements were accurate is important, but so too is understanding the manner in which the collection was created and the purposes it was intended to serve. The discussion of which will be the subject of a later posting. Comment I: The New York Times Article and Editorial. Comment I on "Morton vs Gould"
Cuvier, Baron. The Animal Kingdom, arranged in conformity with its organization. New York: G. & C. & H. Carvill, 1832. Meigis, J. Aitken, M. D. 1866. Observations upon the Cranial Forms of the American Aborigines, based upon Specimens contained in the Collection of the Academy of Natural Sciences of Philadelphia. Proceedings of the Academy of Natural Sciences of Philadelphia, p. 198- 212. At a later time I'll compile a more complete bibliography, but it did not seem appropriate for a series of blog posts at this time. I also need the time to chase down the links to the appropriate digital copies of some of the works.